Another month, another This Feeling night at the Night And Day in Manchester and this time they've paired up two of the most exciting bands in Liverpool and Manchester on the same bill. The Vryll Society, newly signed to groundbreaking hometown label Deltasonic, prove the substance to the growing buzz about them, whilst The Watchmakers, veterans in comparison, charm us with their hook-laden sunny take on psychedelic. We miss out on opening act Jordan Allen as we're round the corner at Soup Kitchen watching Ryley Walker, but the reports we hear suggest that he's continuing to establish himself as a force to be recognised with on the local scene before spreading his wings to record his debut album and take on the world. Although they're billed as headliners, The Vryll Society perform second, possibly to allow the entourage they've brought over to get the last train back home. The Night And Day is fuller than I've seen it for one of these nights before and rather than just the night's photographer, there's at least five all looking to capture a band on an inexorable rise to the top. They start the set with Beautiful Faces, the song that first brought them to our attention earlier in the year and it's a perfect taster for what's to come. They have an intuitive instinct for melody and groove that so few of their contemporaries possess and an ability to fuse together a range of styles and influences into something that's extremely fluid. The six minutes plus of Great White's Fin is a sonic dreamscape that floats from shoegaze into something approaching prog and back again without skipping a beat, whilst Cosh sounds every inch a potential single. It's impossible to take your eyes off front man Michael. His boundless energy as he prowls round the stage, hair flopping from one side to the other like a young Tim Burgess, is as infectious as the music his static band mates are creating almost nonchalantly in comparison. They finish with current single Deep Blue Skies and by the time Michael leaves the stage for his band mates to jam to the end of the set they've converted another room of people to their blissed out loved up tunes. 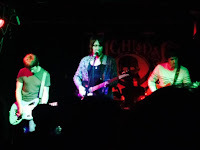 Manchester's own The Watchmakers have been on the scene a bit longer, but have over that time been slowly gathering a growing following and it's no wonder given they deliver a forty-minute set that's full of high-energy soul-drenched songs that would melt even the coldest heart. They trade in big guitar hooks attached around swirling melodies and front man Rich delivers vocals that perfectly capture the mood and the spirit of the music his band mates are creating for him. Starting with debut single Illumination and its addictive "see the new horizon now, break on through" refrain, they don't let the pace drop throughout the set, moving straight into another familiar track Carpe Diem and then Stairway To Your Mind whose hook line will leech itself in your head with one listen. As they make they through their seven song set they're even able to leave out recent single Kiss The Sun, a brave move given these nights are an effective showcase for new bands, but the strength of the songs that are in there instead more than compensates. They finish the set with an old favourite, Before Questions Become, which was one of their first demos they revealed, but it has the same timeless qualities as what's gone before it. The Watchmakers have been around a long time now in new band terms, but in those three and a bit years they've been on the cusp of breaking through - whatever the reason it's not down to lack of tunes or their live set, as tonight proves once again, that's for sure. Hopefully their time will come soon. The Watchmakers' official website can be found here. They are also on Facebook and Twitter.